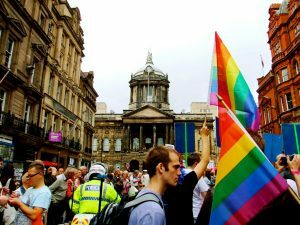 LCR Pride Foundation has revealed the dates and location for the 2019 Pride festival, along with its new identity – Pride in Liverpool. The free festival will return to the Tithebarn Street site in the city centre on Saturday 27th with multiple stages of live entertainment, a dedicated youth zone and whole host of inclusive activities, stalls and food and drink vendors. The fun will continue on Sunday 28th July with more activities taking place at a soon-to-be revealed city centre location. Festival goers will also be invited to March with Pride along the traditional route from St George’s Hall, finishing at Moorfields. Those wishing to march can sign up to the LCR Pride Foundation mailing list to be notified when registration opens. Pride in Liverpool 2019 will be the first festival delivered by the recently-established LCR Pride Foundation. Co-chairs Andi Herring and John Bird said: “We have been overwhelmed by the support shown to the LCR Pride Foundation since its launch at the start of the year and are excited to now be able to reveal the 2019 festival dates. remind me to book that weekend off ! Can’t wait .